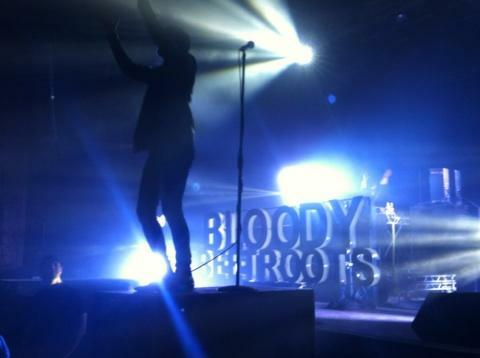 Friday, October 27 — Wolfgang Gartner and Bloody Beetroots threw it down hard at Congress Theatre in Chicago on Friday. We arrived right as Wolfgang Gartner went on and eventually worked our way to the front for Bloody Beetroots. I held on to the fence to claim my spot right in the front when one of the Beetroots came to the front and held the microphone out for the crowd to scream for the song “Warp.” Needless to say that was my favorite moment. Beetroots raged Congress until around 2:30 a.m. I wasn’t too familiar with Beetroots or Gartner before the show because I generally get more into drum and bass dub electro beats before house. I love all EDM but I was not expecting much from this show. Instead I was completely blown away. Saturday, October 28 — Kill the Noise, Baauer, Knife Party and Tommy Trash sold out Congress on Saturday night. We got there right as Baauer went on. I had never heard of him prior but a friend said he was dying to see Baauer and I now understand why. I am listening to a Baauer Pandora station right now. It was love at first bass drop. He had a lot of remixed hip hop songs and heavy bass beats that got the girls in the audience twerkin. There were too many couples that I had to push out of the way as they practically got it on in front of me. Regardless Baauer had the crowd raging hard. Then was Kill the Noise but unfortunately bathroom breaks, beer runs and moving upstairs looking for people distracted my group. Finally we made our way to the front row of the balcony and Knife Party came on. The crowd went wild as they remixed a few Swedish House Mafia tracks. They also remixed Bangarang into Kyoto by Skrillex which was one of my favorite moments. Internet Friends by Knife Party was still the best though. Then Knife Party cut their set off and all of the sudden Tommy Trash came out. The audience was a little confused by still ready to rage. I liked Tommy Trash and continued to rage hard but the crowd began to clear out slowly because I think Tommy Trash was a little too house for the audience filled with a lot of random kids who heard that Knife Party was a cool dubstep DJ. Friday was my first show I got to take my new rave shades to and it was awesome. I love going up to random kids and putting the shades on them. The amazed and complete WOW reactions are hilarious. 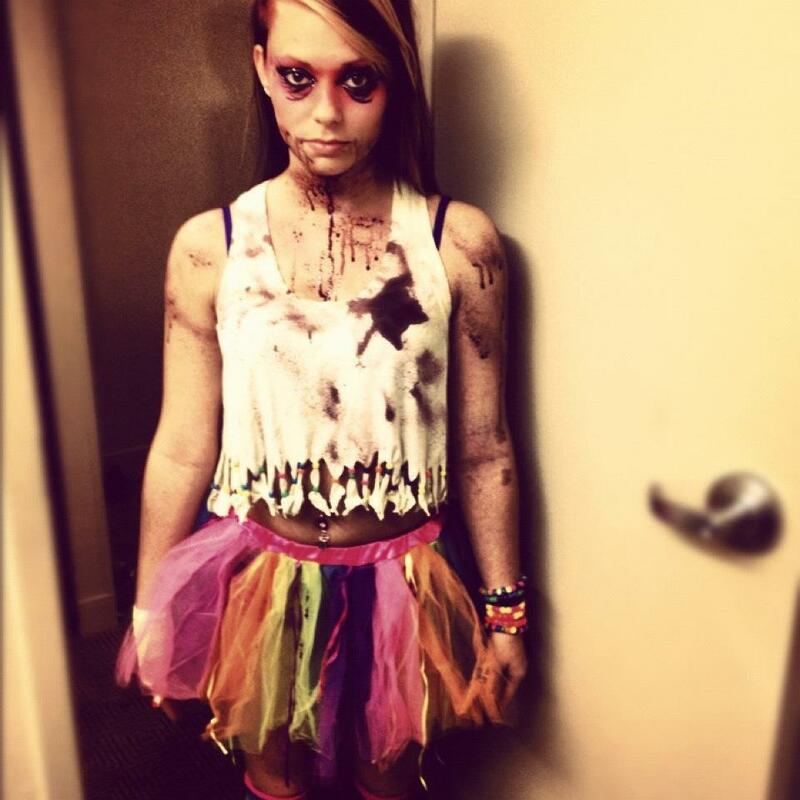 On Saturday I dressed up as a zombie raver and it was probably my best halloween costume yet. Overall my weekend was pretty awesome and I can’t decide which show was better. Beetroots vs. Knife Party. Both were equally breathtaking. I hope you’re all having an enormously crazy day! It’s time for another chapter of the Harlequins writing music. I can’t believe I’ve actually created 10 of these posts. I was half expecting somebody to have told me to shut up about my music taste after the first chapter! I’ve been quite busy on getting some new poems and other miscellaneous writings complete this week. This music has helped enormously! I can’t really imagine writing in silence anymore. Now, let us delve into the musical minds of incredible artists the world over! And there we have it for another edition of the Harlequins writing music! I don’t think I’d be anywhere near as willing to write as much as I do without my musical backdrop. I gives me ideas, it keeps me calm and it is quite simply something I enjoy. It is almost like an unseen assistant. As always, check out all of these bands. I try to keep these lists reasonably varied so hopefully there will be something you’ll enjoy regardless what you’re musical creed is. Thank you for reading my friends! (I feel like I posted this before, but no matter. the crowd went nuts when this song came on. Diplo KILLED it Sunday) I’m thinking of going to see Major Lazer on my birthday…. OCTOBER 27TH @ Terminal 5!! !